Chris Christensen, area Vice President of Neis Insurance, has recently been awarded with the 2015-2016 Presidential Award of Excellence. This award is well merited for his work in the community, and well deserved for an outstanding member of the Neis Insurance Agency. 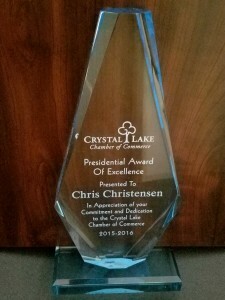 Chris has shown exemplary dedication and commitment towards the Crystal Lake Chamber of Commerce.